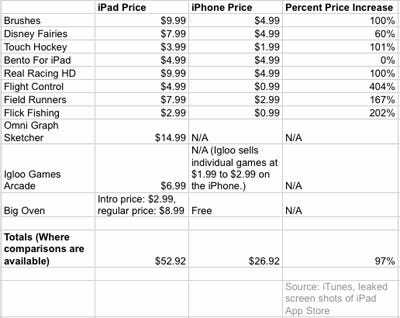 The first applications for Apple’s iPad will cost roughly double their iPhone equivalent, according to a brief analysis we performed on leaked screenshots of the iPad App Store. This pricing strategy makes sense, at least for now. The iPad is new, and will have a small initial user base, so it makes sense for developers to test the waters with higher-priced apps. Plus, iPad apps will likely generally be more complex and sophisticated, or at least feel that way, which could support higher prices indefinitely. As the platform becomes more popular, eventually, developers may be able to get higher sales by cutting app prices and getting higher sales volumes. That — and the desire to get as high as possible on Apple’s lists of top unit sellers — have pushed prices way down on the iPhone. But for now, for the iPad, it’s probably a good idea to start off with apps at the high end of their potential price ranges. 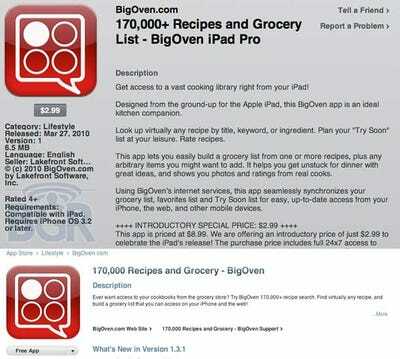 To find these apps, we flipped through leaked screen shots of the iPad application store, tracking the prices. We compared them to same apps for the iPhone. You can see the results in the chart above.